Beer sweet beer. 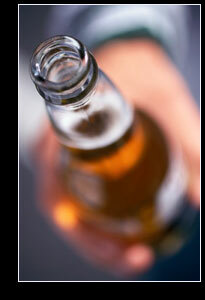 No other beverage has caught the hearts and heads of men across the world quite so sweepingly as our love, beer. From the cool clear amber ales to the pitch-dark stouts and all that's in between, there seems no end to the joy beer can bring to a man like myself. And of course, I know a female or two who enjoys a tall glass. But I'm not here to ramble on all day about how sweet beer is, hey no wait a second, yes I am. In fact that's exactly why I built this site. Everybody likes beer right? So everybody should get together and share the love! I bring you all things beer, and some other things close. This web site is an open community, built as much for you the visitor, as for me the ultimate beer lover. E-mail me, talk to me, shout at me, get drunk with me. Don't drink alone. Drink in pairs. That doesn't mean two-fist. To begin with, beer isn't all serious. There has to be some room for humor. With that said I bring you the beer humor (humour for all of you beer loving Canadians out there... so all the Canadians out there) section, with jokes from around the world and around the corner from your local tavern. Have a great suds joke? Be sure to let me know! Now that your relaxed and laughing, you may find you want to reflect. Have a look at that glass in your hand, what do the contents represent? What's the past of this drink that you can be damn sure about a million other people are enjoying at exactly the same time as you? Well its time to find out in the beer history section. From its origins to its slide down your throat, theres a lot more to know than you might be aware.. or remember tomorrow. Even with all that history, there is still news in the beer world each and every day. Scientists in laboratories in countries with names I can't pronounce are coming up with ingenious ways to make my Sunday afternoons a little smoother, and a touch more enjoyable. Keep up with the joneses (and the coors'), check the beer news section. Feeling fanatical? Like to get wrecked in public? Maybe you'd feel more comfortable surrounded by others who love the same thing. There are loads of beer festivals popping up as North America moves into the warmer weather, and you should make sure your involved. No need to wait until Octoberfest! You can find festive drinks all year round! What would a beer site be if we didn't include a section that lets us talk about what we truly love: our favorite beers. You know you've got a favorite, and it's time you let the world know what it is. At beer sweet beer.com, most any beer is a sweet one, but we know different brews appeal to different brows, so tell us a little about yourself, and tell us a little about your drink. That way we can get to know the whole you, beer belly and all.